This dessert of Classic French Pots de Crème is simple and elegant and the perfect ending to a special dinner. It’s a rich chocolate custard you can garnish with pomegranate arils, raspberries, strawberries or orange zest for a festive presentation. This takes me way back; almost further than I can remember. But luckily I do remember. Me, the girl with 5 years of French and a love of cooking and I wanted to combine the two. He, the boy I wanted to impress with something au Francais. I wasn’t an experienced cook and he certainly wasn’t a demanding admirer but I wanted it perfect and someone with more experience than myself suggested I try making Classic French Pots de Crème. It sounds silly until you pronounce it correctly (poh de crème) and it seems like chocolate pudding until you take that first bite. That first luxurious, silky, smooth, rich bite. The taste is certainly part of it but there was more. It was French. It was chocolate. It was quite simply love. This classic dish is deservedly so. My ONLY caveat over the years has been to mix up the liqueur I add to the recipe. Quite often just orange liqueur makes an appearance but I like change. I’ve done brandy and bourbon and rum. Kahlua, mint and raspberry liqueur have had their moments in the sun too but this time I wanted to use the last of the ruby red pomegranate arils in the fridge so I dug into my liquor stash and found what I hoped I had. Yes, some Pomegranate Liqueur! I love the idea of something just a bit tart; it is a nice compliment to the silkiness of the chocolate; just perfect if you ask me! I was the lucky recipient of a box filled with Ghirardelli Chocolates; what a delightful surprise that was. 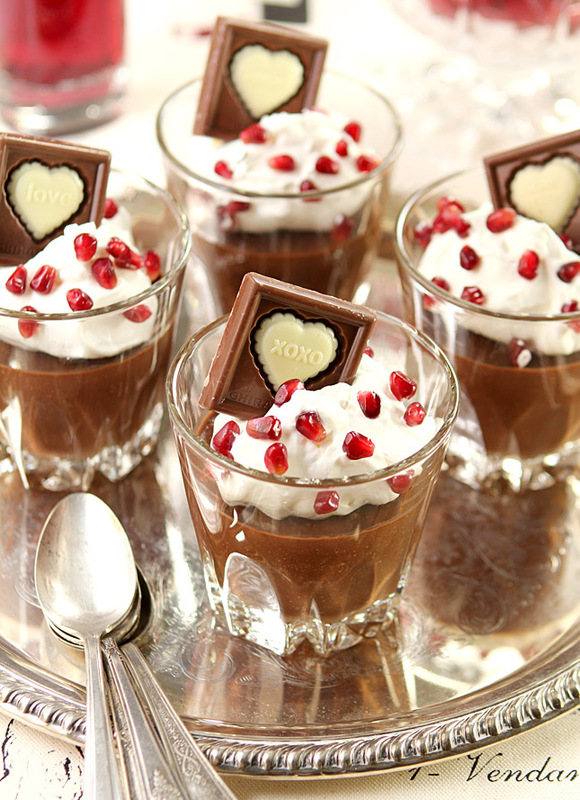 Ghirardelli has made the cutest seasonal treats this year and I thought they would be perfect to adorn this perfect Valentine dessert that I wanted to take to neighbors. The parents would get the Pots de Crème but the kids would not be left out. Adorned with tokens of love, each candy professes a time honored Valentine message including Love, Sweet, XOXO and Be Mine. Everyone wins! I love this recipe; it’s the same one I made all those many years ago (and yes, it seems it did win someone’s heart…until I was ready to move on!). Many recipes for pots de crème call for a water bath in the oven to finish them; this does not and that easier preparation in no way diminishes the final result. It is très Delicieux! The Ghirardelli chocolates were a big hit; I’m just delighted I had them to use for this preparation. If you’re making this for Valentines Day and can’t find any pomegranates, no worries; try raspberry liqueur and adorn with some fresh raspberries or strawberries. Just as delicious and beautiful and yes, just as French. Make it for your amour! Melt the dark chocolate in a double boiler or fabricate our own with a large pot with simmering water and a large stainless bowl held over it. Whisk together the egg yolks, sugar and cocoa. Heat the cream and milk together until it is almost boiling (scalding). Remove from heat and whisk the cream/milk mixture very slowly into the eggs mixture; whisking continuously to insure the eggs don't scramble; continue until all of the milk mixture in incorporated with the egg mixture. Pour the mixture back into the large saucepan and bring to a simmer. Stir constantly with a wooden spoon for about 5 minutes or until the mixture coats the back of the spoon. Once it does, slowly whisk the custard mixture into the melted chocolate. Add the liqueur and whisk until incorporated,. Pour into 4 individual serving containers (I just used cocktail glasses). Cover the tops immediately with plastic wrap to prevent the top from developing a film. Let cool for 10 minutes then refrigerate for a least an hour...the longer the better. Will hold for 3-4 days covered in the fridge. 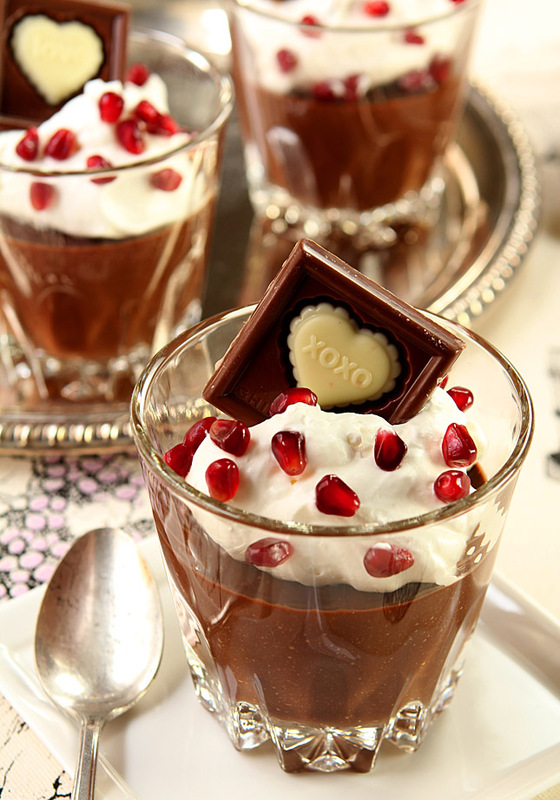 When ready to serve; top with a dollop of whipped cream and sprinkle with pomegranate arils. My grand daughters love pom arils and chocolate! They would so enjoy this dessert. Your presentation is beautiful perfection! 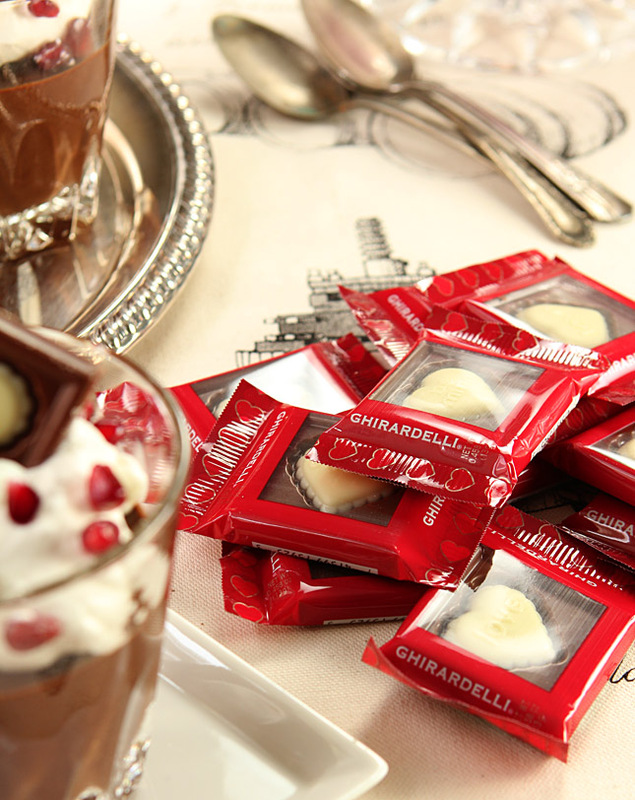 The gift of Ghirardelli chocolates was the ideal addition to your pots de creme. They are so cute…and the kids really did love them. I would too; much more so than those hard candy things. I’ll save some for you! Is there anything in this world that is more perfect than Pots de Creme? Valentine’s Day or any day, it’s one of the most perfect desserts ever devised. I agree. It’s so simple I can sometimes forget just how perfect they are. Which I suppose is good; they are certainly an indulgence. Wow, Barb, how I miss you living in your old house! I would have run the mile to come share this treat and run home again to make up for all of these delicious calories! I am jealous of your new neighbors. Did you tell them they will gain 10 pounds living next to you? How lucky for them!! This is a very pretty Valentine’s treat. Love those rubies! 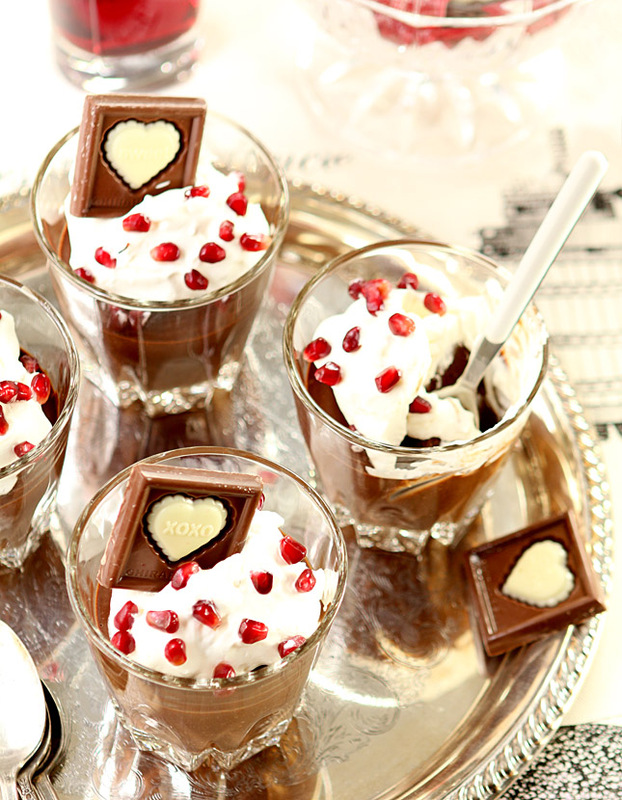 In fact I like the whole pomegranate and chocolate combo — wonderful idea. We haven’t made pots de creme for ages and ages — definitely need to. Perfect dessert for Valentine’s Day. Or any other. 😉 Thanks. I first thought of raspberries but I’ve done that so often; was delighted to see some poms in the store and I just love how pretty they are…they really are sparkling little jewels.